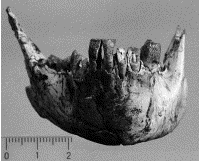 A mandible of Rangwapithecus gordoni from the early Miocene site of Songhor, Kenya, provides additional information about this relatively poorly known taxon. The R. gordoni sample is small, being composed of dental and a few gnathic parts. The fossil described here provides examples of previously unknown dental and mandibular anatomy, and confirms former reassignments of isolated anterior teeth based on less certain evidence. The phylogenetic status of Rangwapithecus, its distribution, and paleobiology are briefly reviewed. Rangwapithecus shows a suite of dental and gnathic features that warrants its generic distinction from Proconsul. Derived features shared with Nyanzapithecus and Turkanapithecus indicate that it is an early member of the subfamily Nyanzapithecinae. Its molar morphology suggests a considerable component of folivory in its diet. A review of the hypodigm shows Rangwapithecus to be restricted to Songhor. This distribution parallels that of Limnopithecus evansi, and is mirrored by Limnopithecus legetet and Micropithecus clarki suggesting that Songhor may have differed ecologically from other more or less contemporary sites in the region. Figure 1. The KNM-SO 17500 locality at Songhor showing provenience. Figure 3. KNM-SO 17500. A: right lateral view. B: left lateral view. Figure 4. KNM-SO 17500. Anterior view.